In celebration of the opening of the Burj Khalifa, the world’s tallest tower, I thought it would be good if our issue featured the world’s tallest cover. It quickly became our best-selling issue so far. My interview with the biggest ego in pop for Time Out Dubai. For some reason he got really upset when I mentioned guitars. In 2009 I flew the new Emirates A380 to Sydney for this travel piece which appeared in Time Out Dubai. 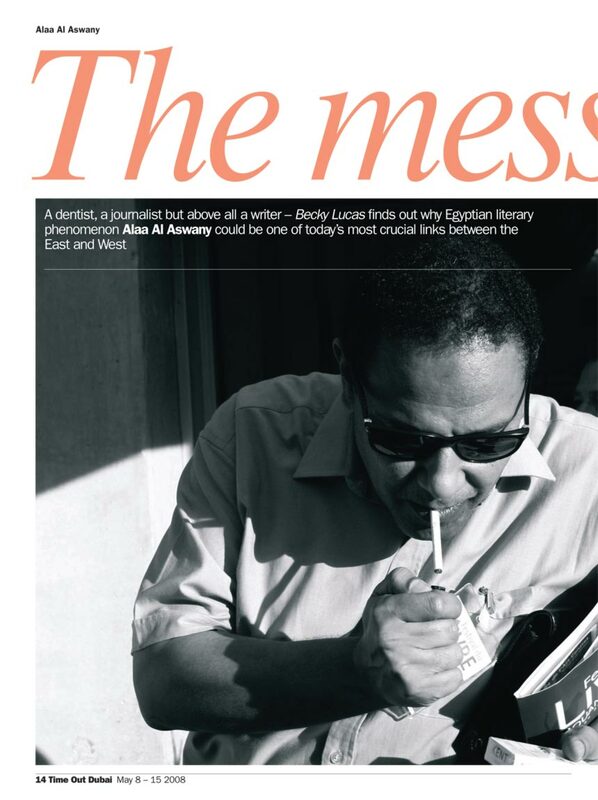 Here’s an interview I did with acclaimed Egyptian author Alaa Al Aswany for Time Out Dubai. Welcome to my blog. Former editor of Time Out Dubai, Time Out Style and recently the launch editor of Time Out Tokyo’s first print magazine, I have written and edited features on all sorts of subjects for all sorts of magazines, newspapers and websites. These span publications* such as The Telegraph, The Guardian, Sunday Times Style, Financial Times, BBC Travel, Mail on Sunday, Condé Nast Traveller, Vice, Cosmopolitan and Company. I have worked as assistant editor on Dorling Kindersley’s New York Times bestseller and Design Week editorial award-winning book Pick Me Up, as well as deputy editor on Lastminute.com’s first print magazine. In the Middle East, I have contributed a regular column to Esquire, and written for Harper’s Bazaar, Grazia and Men’s Fitness among others. I have also been the main video presenter for timeoutdubai.com and regularly represented the brand on local TV and radio, including on BBC World and bi-weekly on Virgin Radio. *Pseudonyms include Jenny Childs (my mother’s maiden name), Kate Douglas (my sister’s name) and Lucy Morgan (not sure why with that one – it was just the first name that popped into my head).